When a tree has been cut down or felled, then it is relatively easy to work out its age by counting the growth or annual rings that can be seen on the sawn-off stump. Under the bark of a tree is a special tissue (called the cambium) which forms new cells so that the tree can grow. 1. Find a cut-off tree stump, preferably one that is fairly big and where the rings can be seen easily. The most recent rings are those nearest the bark, the oldest are at the centre. The wood at the centre often is darker in colour (and may have started to rot); this is sometimes called the heartwood. 2. 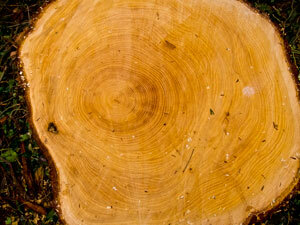 Count the rings on your stump carefully and estimate how old your tree was when it was felled. 3. In which year did your tree germinate? 4. Take a digital photograph of the stump (from above) and print out a large copy so that you can still see the rings. Mark on the photograph the rings that correspond to the year when you were born, when your parents were born, and perhaps even when your grandparents were born. Counting rings is a quick and accurate way of determining a tree's age once it has been cut down. However, you cannot use the rings in a tree that is still growing - unless you saw it down and kill it! As older trees tend to grow at a fairly steady rate, you can get a rough idea of their age by measuring their circumference or girth. Measure a metre up from the soil. With someone to help, run the measuring tape around the tree and record the circumference/girth in centimetres. Take the figure for the cirumference/girth and divide it by 2.5. So, if the girth was 140 then the approximate age is 140/2.5 = 56. I would love to know who published this? In any given year, an annual ring will have two components — a lighter coloured band of tissue / vessels formed in the Spring and Summer and a darker band that is created when growth is slower in late Summer / Autumn. It would be helpful to clarify how to count the rings. Do you count the light rings, the dark rings, or both? and yes, it is an approximation. Your calculation 140 what? mm? cm? inches? Is there a life expectancy age of the different tree species and is there an average age when each particular tree species needs to be cut down before it falls on something or someone? very helpful information – thank you!